I like to draw. I have been drawing as long as I can remember. My interests are fantasy people and detailed architectural confections. I schooled at San Jose State, the Ecole des Beaux Arts in Paris, and The Art Center in Los Angeles. 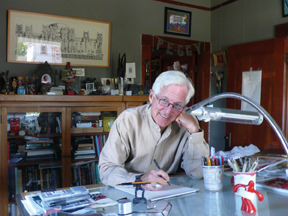 During my years in L. A., I worked at M. G. M. Studios as a set illustrator, and in 1965 struck out on my own as a freelance designer, doing anything requiring drawing. I did set designs for television and credit designs for films, airplane bulkhead murals for Continental Airlines and murals for airports and department stores. Some of my commissions took me to Buffalo N. Y. for a Hyatt House and Chicago for the film festivals. I did spot illustrations for the London Times and album covers for Blossom Dearie. I hope to draw as long as my eyes and hands permit. Wedding invitations, posters, I welcome them all. If you like what you see, please contact me at my home/studio in Napa. I have an extensive portfolio and a large collection of available prints.